A few weeks back I ran across a tiny announcement by a friend on Instagram of this amazing opportunity to spend 3 full days crafting with some of my favorite people Kaari Meng (of French General fame), Molly Meng (the crazy creator behind 8mm Ideas) and Cathy Mogull (from Summerland Mercantile who, unbeknownst to her, started me on this path of expanding my creative horizons by taking classes near and far). As fabuous as those three are, the piece de resistance is that the event is being hosted by THE Wendy Addison! I am really looking forward to mid-September and my visit to the Theatre of Dreams! As I mentioned in the previous post, I have updated the Caring Hands calendar for some events, planned and potentional, for this year. Mimi’s birthday party (I want Gail or Jackie to post this as a test of their access. Other things to consider: Mother’s Day, Father’s Day, Easter (I guess I can post that), visits by out of town family members. If you want me to post something, please let me know. However, I would much rather give each interested person access to post directly to the calendar themselves. This isn’t MY calendar, it is OUR calendar. It is kind of fun and kind of frustrating piecing all of the technology together. Domain names, blogs, Etsy stores, web sites, etc. I am finding it easier to imagine an online presence and learning how to create and code what I’ve imagined. I don’t see how students of code approach learning any other way. We (my DH and I) registered a domain name last night that we can both use. I used WordPress but am second guessing that choice. I have 48 hours to cancel. I can still go to another host and register the same name. The issue really is the approach of the host and how much knowledge you need to build what you imagine in your mind. Now we want to create a simple landing page. Maybe even as simple as a black screen with two buttons, like his and hers. One would click on the “his” button and go to his stuff (blogs, stores, etc.) or click on mine and go to my blog, stores, etc. Pretty simple concept, one would think. My dilemma seems to be that it appears that using WordPress as your host starts with the blog and works out and around, which makes sense because blogs is how they started. If you start with another host you start with a web site and link your blog. I feel like I need to create a site to stick in front of my blog (for lack of a better word). I am thinking of it like the nucleus. In one way the blog was the nucleus, in the other way the domain name site is the nucleus. There is probably a clearer way to describe it but I can only compare it to what I know. Feel like you have joined a conversation midway through? Welcome to my world. Stick around. I bounce around a lot. Have no fear, you will catch up. 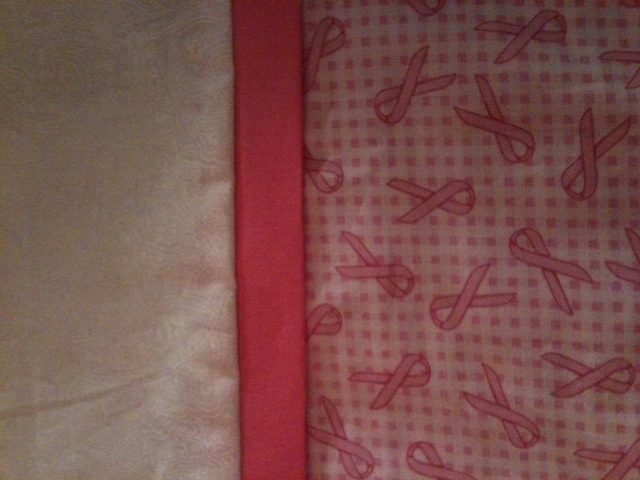 For those of you who have been waiting for my breast cancer awareness pillowcauses I am pleased to offer 6 for sale. 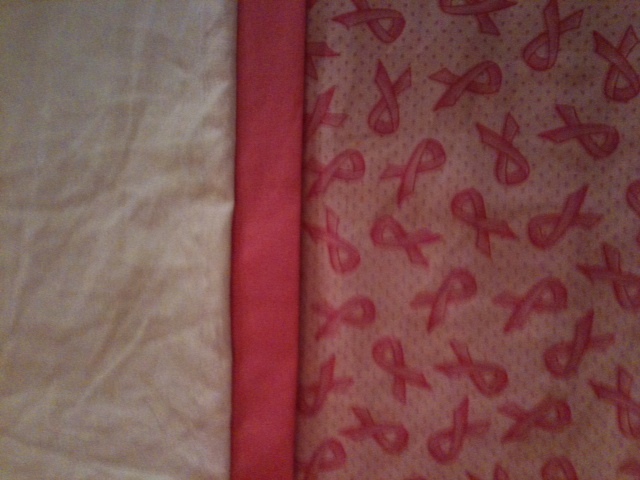 All pillowcauses are 100% cotton. 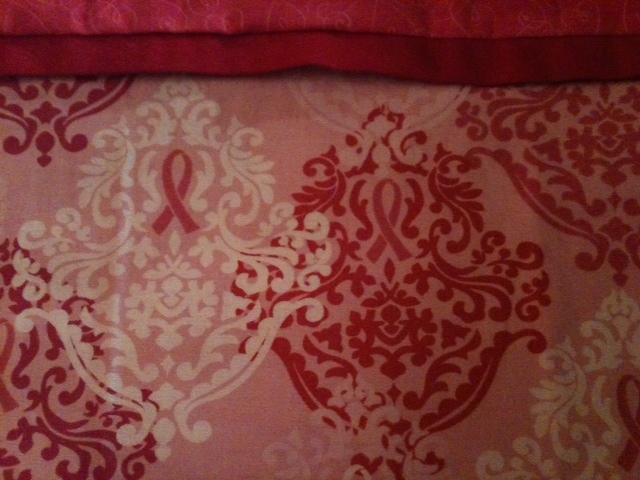 They are one of a kind, are available for $20.00 each and ALL proceeds go towards my Avon Walk for Breast Cancer on September 17 and 18, 2011. Once one is gone, it is GONE. 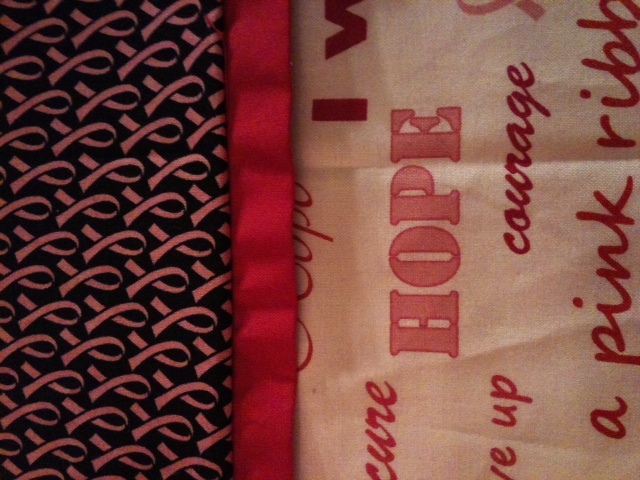 #1 featuring pink awareness ribbon on black cuff, dark pink band, words of hope on white body. #2 featuring pink heart doodle on cuff, pink band, words of hope on black body. 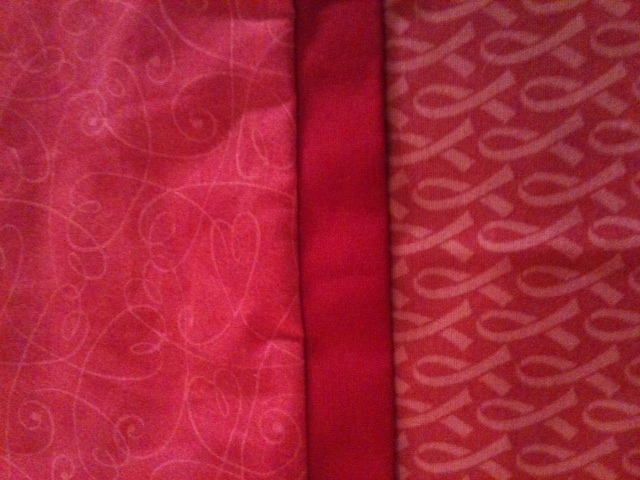 #4 featuring white and white paisley on cuff, pink band, dark pink awareness ribbon on light pink gingham body. #5 featuring white on white paisley on cuff, pink band, dark pink awareness ribbon on light pink with random mini-dots body..
#6 featuring pink heart doodle on cuff, pink band, medium pink awareness ribbon on dark pink body. 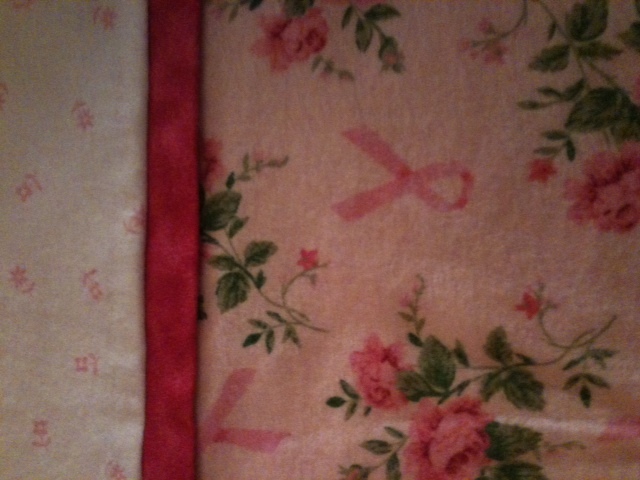 * Pillowcases for a cause. Today is Monday, June 27, 2011. I have just hit the “send” button on the e-mails to our family announcing my participation in the Avon Walk for Breast Cancer. What follows in this post was written off and on over the past several weeks. I realize that it bounces around a bit. I apologize in advance if it is hard to follow. Thank you for walking with me over the next 80 + days as I work toward crossing something off my bucket list. I am looking forward to this journey but more than that, I am looking forward to generations that don’t have to live in fear of this disease. Since my plan is to encourage as much of your participation as I can in my walk to end breast cancer, I intend to post frequently to keep you in the loop as to my training successes (and failures, let us hope the failures are few and far between) and planned events such as training walks and mini-fundraisers I plan to hold in Ventura County. I am hopeful that my comments will light a fire inside each of you to take some kind of action toward the cause: sending me notes of encouragement if my posts sound down, going for a training walk with me, attending one of my mini-fundraisers, buying one of my handmade “pillowcauses” (pillowcases for the cause), donating to the Avon Walk for Breast Cancer, or maybe even registering to walk along with me. Whatever support you can provide in whatever way you choose to make it is a great gift to me and to the cause. Most of all I ask that you keep me in your prayers. While I am excited and energized, I am scared. There are a number of reasons that this is WAY out of my comfort zone. Perhaps over the course of the next 83 days I will share some of that with you as well. As of this writing, (6/13/11) I do not plan to announce to my extended family my participation in the Avon Walk for Breast Cancer until 2 weeks from tonight (6/27/11). My reason for doing this is out of respect for my dear SIL Cyndi by allowing her to complete her Relay for Life fundraiser (6/24-25/11) without any competition from me/my cause. I realize that if you are reading this now, it is 6/27/11 or later. There is already so much to say in regards to my decision to take up this cause, my training and my fundraising. I have a good deal scheduled for the next 2 weeks until I officially announce to the masses the challenge that I have already made to myself. Leading up to today I have: participated in two telephone group conferences, registered for the Avon Walk for Breast Cancer, started sending out e-mails to my work contacts, co-workers and some of my Facebook friends. Again, out of respect for Cyndi I have delayed announcing my walk on Facebook until after 6/27/11. I have scheduled some mini-fundraisers: An ice cream social; a lunch/game day at work and the sale of what I am calling “Pillowcauses”. I will write more about those later. What follows are my thoughts and experiences on the dates noted. 6/13/11: I have been in training for almost a month. It has been a slow start because we travel so much and I haven’t yet found a way to “fight” for my time to train. Also we are just a few weeks away from Chelsea and her sweet little family moving to Seattle so time with them is even more precious than ever; I tend to choose it over most anything whenever possible. As of today I have 97 days to the walk and something like 14 until the last time we see them before they move. I will use the 83 days between their departure and walk day to train and enjoy what I can of the next 14 with them. I took two walking breaks today, one in the morning and one in the afternoon. The morning break was just over a 1.5 mile walk in about 31 minutes. I am not ecstatic about the pace but it is still early and it is what it is. I am not a speed walker; I have a very short stride, which causes me to cover less ground in the same amount of time as most other people. It is frustrating for me but I read somewhere that you shouldn’t change your stride. Right or wrong that is the approach I am taking now. The Avon “experts” tell me that a 20 minutes pace is good enough to walk the marathon distance the first day. I have concerns that for me and my short attention span, walking at that slow of a pace will cause me to loose interest before I have completed the 26.2 miles the first day of the walk. I still have the option of only walking 13.1 miles each day, but that is not my goal. That is not my challenge to myself. I may have to settle for that eighty-something days from now but I don’t have to settle for that today. If I shoot for 26.2 miles on Day One I may not make it. What I do know is that if I shoot for 13.1 miles on the first day I won’t make 26.2. 6/18/11: (Saturday) I participated in a 6.9 mile training walk along the bluffs and through neighborhoods in Goleta, California. It was a lovely day. No injuries, cool cloudy skies, slight breeze; a great learning experience. One thing I learned was to NOT drink a lot before the start of a long walk. There were no restroom stops on this walk. I did manage to find one at a golf course somewhere on mile 5.5. I won’t be doing THAT again. Shoes were comfortable; I discovered clothes made of wicking material and I am in LOVE! I need to pick up a jacket or long sleeve shirt, not used to spending so much time in the sun. Felt really great at the end of the day. 6/19/11: (Sunday) Curt had a game today so I walked from the ball park to the swim park, over the freeway overpass, back to the swim park and around the perimeter walking path until the game was over and D came to pick me up. About 5.25 to 5.5 miles. Felt pretty good physically but didn’t have any music to listen to so I was VERY bored. Going to have to find ways around that. All in all I was very happy with my weekend. The best part is that so far, I am ahead of my training plan. Some change is so subtle it goes unrecognized until a memory is triggered that causes us to notice the difference between then and now. Today, my trigger moment was walking into Target. When my children were in school, it seemed as though we had a need to go to Target every day. As they matured, became independent and earned their driving privileges, I found myself going to Target less and less. If they needed something, they could go on their own. I realize now, I go to Target perhaps once every 6 weeks, maybe less. Several years ago a developer broke ground on a very large shopping center just north of the 101 Freeway in Oxnard. Due to the economy, the construction was halted. Shells of buildings sit, waiting to be completed. One of these buildings is a ginormous multi-level Target. If it weren’t red and white I would think it was going to be an Ikea, that is how big this place is. When I walked into our Oxnard Target today, the one that has grown old and tired – just like me, I was greeted by a sign that read “We will be closing on July 19 at 6:00 p.m. Please visit our new Target store at ….”. Change is a good thing, I guess. Mothers who find it necessary to go to Target everyday after school with their kids will have a beautiful new Target store to visit. I’ll go there too, once every 6 weeks or so, and perhaps when Chelsea and Abigail are in town visiting, for old time’s sake. A part of me is going to miss the old Target, and the memories it holds. Our lives have earth-shaking events that change us forever – loss of loved ones, divorce, illness. Life is also full of lots and lots of little events, so small we don’t even realize their significance until one day, we walk into a Target store. Good Sunday afternoon, faithful blog readers. We have been so busy since our granddaughter, Abigail was born last March. I haven’t been spending much time blogging lately. I’d like to offer that will change in July when the Sanfords move to Seattle but with so many exciting summer plans, that is a promise I doubt I would be able to keep. One thing I do know and will deliver on is that on the evening of June 27, I will be making a huge announcement here on the blog. I hope you will all tune in on Monday, June 27th after 10:00 p.m. or as soon thereafter as you possibly can to see what all the fuss is about.